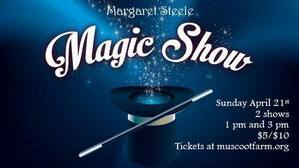 Come catch Margaret Steele and her magic show before she disappears! Two shows, 1 PM and 3 PM. Limited space available, reservations required. Show runs approximately 45 minutes.